When someone suggested that I make soda bread for St. Paddy’s day, I have to admit, I cringed a little. I tried making soda bread once, maybe twice, about ten years ago and it was a complete disaster. It was a ten pound, tasteless, brick-like disaster. 😅 But, I decided to be brave and try it again, with the help of the experts at Epicurious. Their Brown Butter Soda Bread was nothing short of AH-MAZ-ING. Now I see what all the fuss is about! 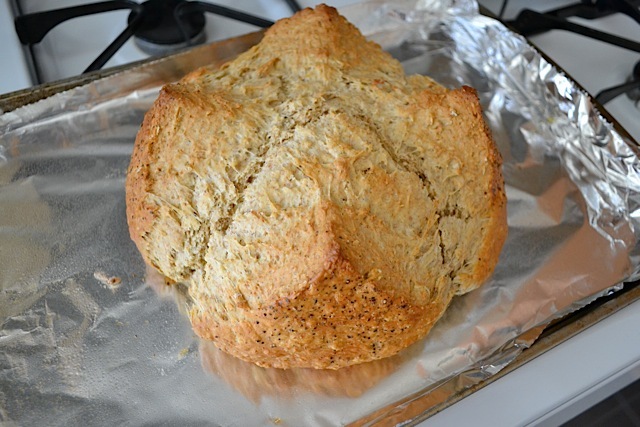 If you’ve never had soda bread, it’s kind of like a big scone. It uses baking soda and/or powder for leavening instead of yeast, and it isn’t kneaded so it has a crumbly, scone-like texture. Couple that texture with the sweet, nutty flavor of browned butter and oats, and you’ve got one incredible bread! This recipe uses rosemary and black pepper for extra flavor, but I have no doubt that it would be just as good without them. I made a couple of small changes to Epicurious’s Brown Butter Soda Bread to meet what I had on hand ingredient wise. First, instead of buttermilk, I substituted regular milk with lemon juice stirred in. This vital because you need the acid to activate the leavening power of the baking soda and powder. Second, I used some whole wheat flour, which I think added to the sweet, nutty, graham-like flavor of the bread. Lastly, I used dried rosemary instead of fresh. Oh, and I also made one mistake – I baked one big loaf of Brown Butter Soda Bread instead of dividing it into two smaller loaves. It still baked up fine, but it would be easier to divide into portions if it were in two smaller loaves. 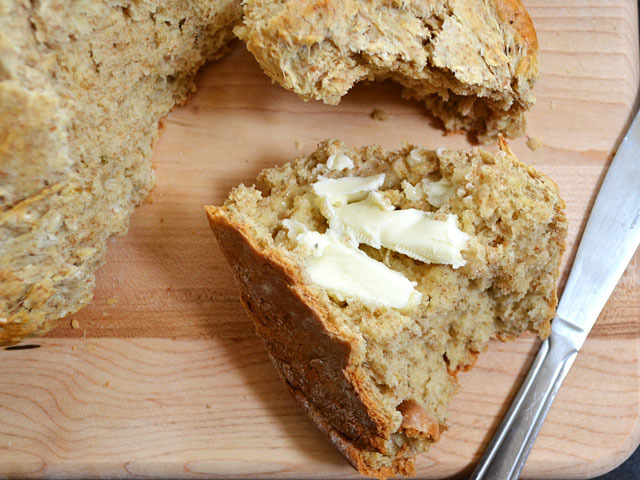 Browned butter gives this rich soda bread a richer, nuttier flavor. 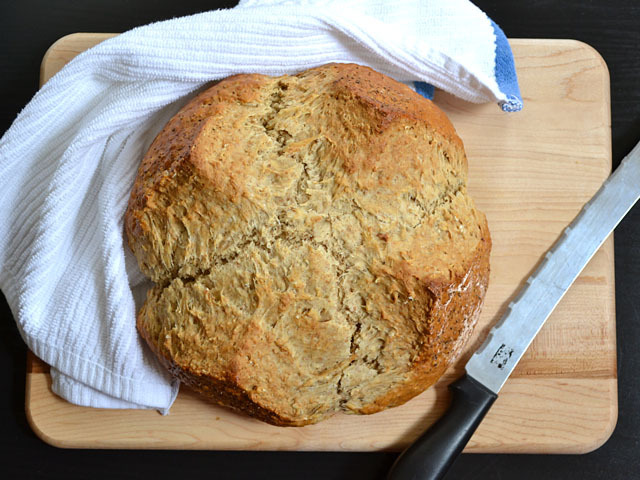 Serve this brown butter soda bread with your favorite soup and stew for a hearty meal. Preheat the oven to 375 degrees. Stir the lemon juice into the milk and let sit until ready to use. In a large bowl, combine both flours, the oats, sugar, salt, baking powder, baking soda, rosemary (crushed or chopped), and black pepper. Stir until combined. Place the butter in a small pot and melt over medium heat. Swirl and cook over medium heat until the butter turns golden brown and smells sweet and nutty. Turn off the heat. Pour the prepared milk and the browned butter into the bowl with the dry ingredients. 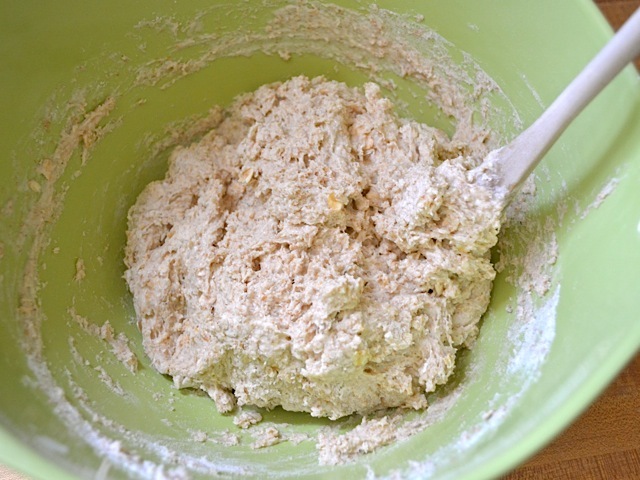 Stir until it is thoroughly combined and no dry flour remains on the bottom of the bowl. The dough will be wet and sticky. 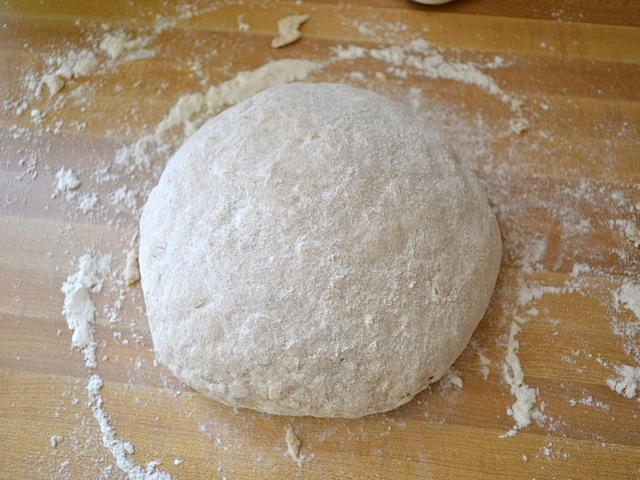 Turn it out onto a well floured surface and knead only a few times (5-10 turns) until it is a cohesive ball. Do not over knead. Divide the dough into two pieces and shape each into a ball. Place the balls on a baking sheet covered with foil or parchment. Brush a lightly beaten egg white over the top of each and sprinkle with more black pepper (optional). Cut an “X” into the top of each with a sharp knife, place in the oven, and bake for 45 minutes. Allow to cool before breaking the bread open. First preheat the oven to 375 degrees. 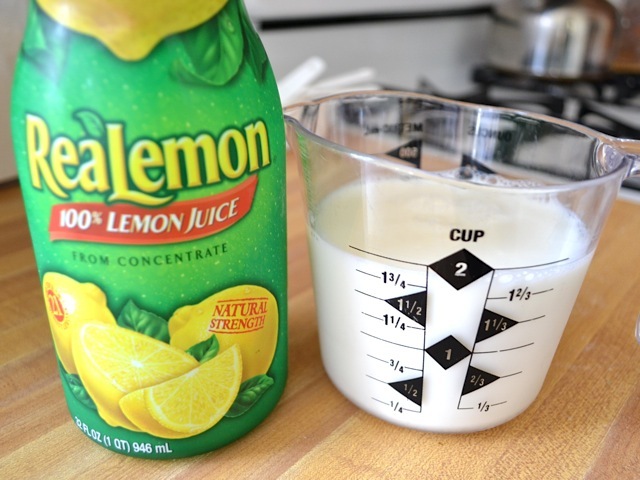 Make the buttermilk substitute by stirring 1.75 tablespoons of lemon juice into 1.75 cups of milk. Let it sit until you’re ready to add it to the dough. 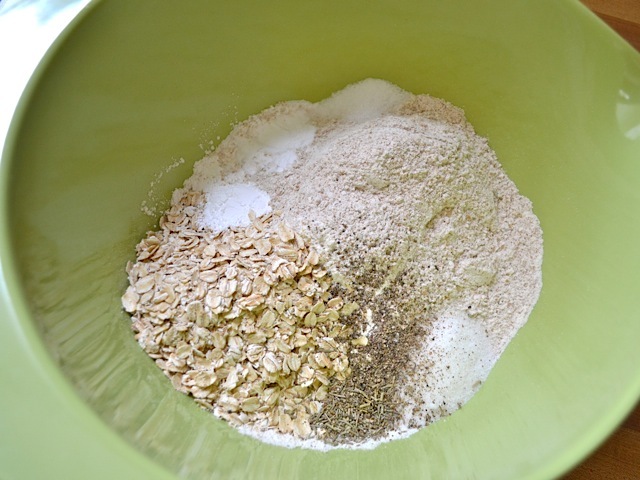 Next, combine the dry ingredients in a bowl (flours, oats, sugar, baking powder, baking soda, salt, rosemary, black pepper). Stir until well combined. 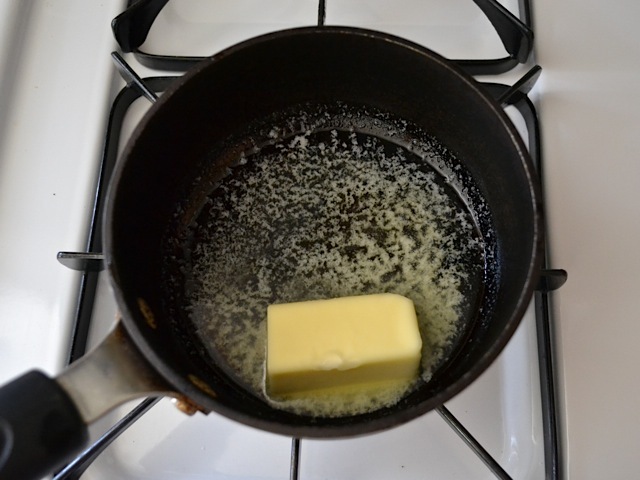 Begin to melt the butter in a small pot over medium heat. Continually swirl the butter as it melts. 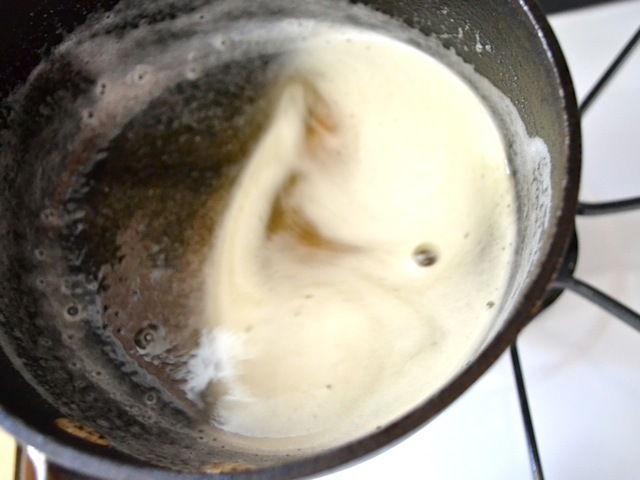 Keep swirling and cooking the butter until it turns golden brown and then turn off the heat. This was hard to get a photo of because there was still some foam on top, but the solids that had sunk to the bottom had browned. Another way to tell is that the butter will take on a sweet, nutty aroma. 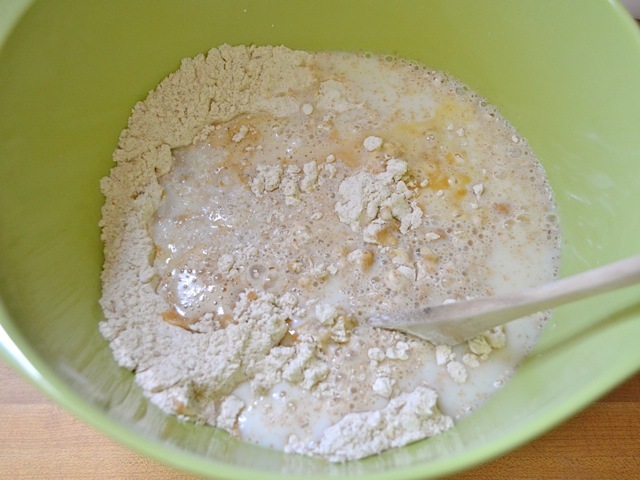 Pour the prepared milk mixture and the browned butter into the bowl of dry ingredients. Stir just until there is no dry flour left on the bottom of the bowl. The dough will be quite wet and sticky. Turn the wet dough out onto a well floured surface and knead as little as possible (less than ten turns) to form a cohesive ball of dough. Kneading too much will develop the gluten in the flour and leave you with a dense, chewy bread. Divide the dough into two pieces and shape each into a ball. Brush the top of each ball of dough with a beaten egg white and then sprinkle with more black pepper (this is optional). Cut a large “X” into the top of each loaf. Bake in the preheated oven for 45 minutes or until the outside is a deep golden brown. 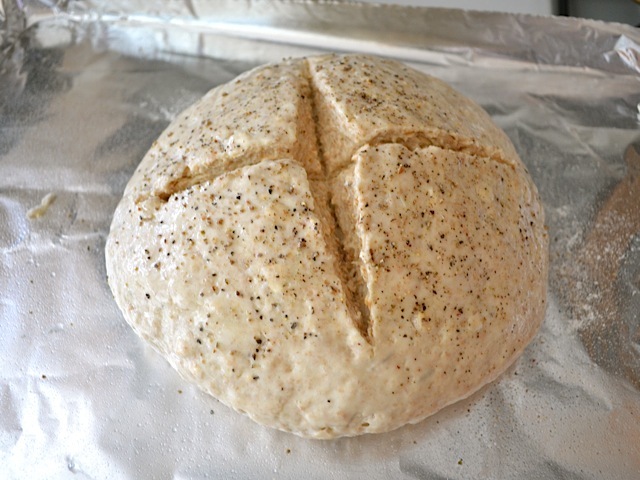 Allow the bread to cool and then break each loaf into four portions. Enjoy with butter and jam! Even though my bread had black pepper and rosemary, I think it would still be excellent with sweet jam. The herbs were not at all over powering. This was fun for St. Patrick’s day! So good!!! It’s not authentic but soda bread is also great with raisins or currents. References to alias soda bread, alias doorstop.. always, double check the rising power of your baking powder and baking soda before you use it even if you’ve just bought it. I learned that the hard way. And always, always handle quick bread doughs and batters as lightly and as little as possible. With yeast breads you want to develop the gluten. With quick breads you don’t. If possible, use all purpose flours for quick breads rather than ‘bread’ flour. “Bread’ flour has more gluten and is more appropriate for yeast bread. I’m no expert but I have read all this advice and have also learned it all the hard way so profit from my experience. I look forward to making this soon. Making brown butter is new to me so wish me luck! This recipe was awesome! My wife loved the bread. Would it be okay to bake this in a loaf pan? If so, should the time be adjusted at all? Hmm, I’ve actually never tried baking soda bread in a loaf pan. I’m not sure how that would affect it. 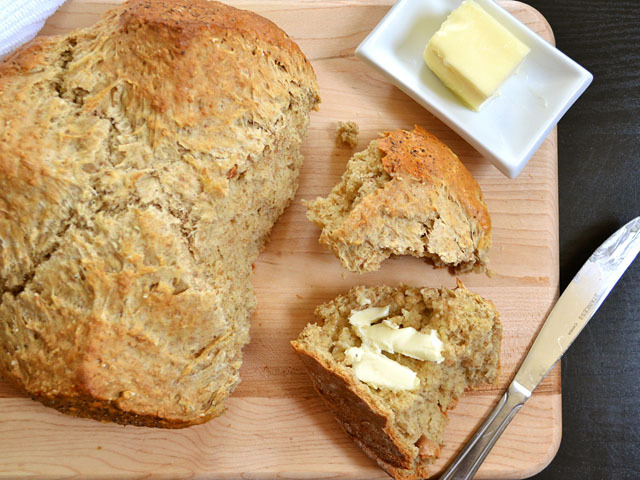 Great recipe for an artisan looking bread that goes nicely with soup or stew! I don’t have any whole wheat flour, is it ok to use all regular flour? Does it change the measurements? I haven’t tried this one with regular all-purpose flour, but in general you need more water when working with whole wheat, so you may need to reduce the liquid if substituting regular flour. I can’t say how much without experimenting with it, though. Hi I was wondering is it a must for the whole wheat flour? Or could you just use white flour? Hmm, I haven’t tried it with plain white flour. Technically it would work, but classic soda bread has that sort of heavy texture that is characteristic of whole wheat flour. The only alteration is that you may not need to use as much liquid because white flour doesn’t absorb as much as whole wheat flour. Just made this yesterday, and it turned out perfect! Crumbly and fluffy and not a brick like I was fearing. I made it without the pepper and rosemary so it would go with more stuff, but it’s definitely a bread that can be made to fit just about any meal. It was so easy! Thanks for making bread easy for those who usually make bricks!